Alton Baker Park, Eugene’s largest developed park, is home to dozens of recreational features and facilities serving the City of Eugene since 1959. The park is made up of two major areas: the more developed West Alton Baker Park, and the 237-acre Whilamut Natural Area. Located immediately east of the Ferry Street Bridge along the north bank of the Willamette River, West Alton Baker Park has had a long history of development, first under the jurisdiction of Lane County Parks Department, and more recently under the jurisdiction of the City of Eugene Parks and Open Space Division. 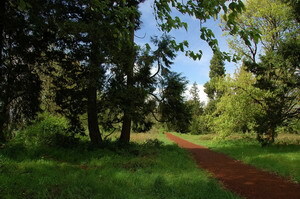 The original 20-acre parcel was purchased by Lane County in 1881, however most of the park land was acquired by Lane County Parks between 1959 and 1964. The current size of the park is approximately 413 acres, including 40 acres (Eastgate Woodlands) which are owned and managed by Willamalane Park and Recreation District. The park is named after Alton F. Baker, co-founder of the Eugene Register Guard, who was involved in park acquisition issues, and was instrumental in acquiring both this park and Maurie Jacobs Park. The Native Plant Nursery has unique volunteer opportunities for community members who would like to actively participate in the full cycle of habitat restoration.